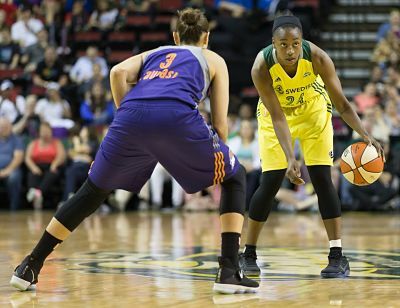 Jewell Loyd eyes the court as Diana Taurasi defends. Photo by Neil Enns/Storm Photos. 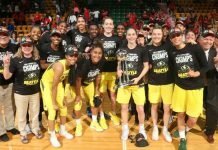 Seattle – For the fourth time in their last five games, the Seattle Storm entered the waning moments of play trailing their opponent, but within one possession from tying the game. For the fourth time in their last five games, they fell short. Brittney Griner and Diana Taurasi both finished with 25 points to lead Phoenix in an 85-82 victory over Seattle at KeyArena, as a Sami Whitcomb three-pointer was off the mark as time expired. 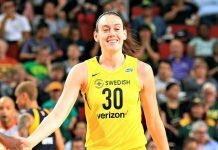 Breanna Stewart had 21 points to lead Seattle, as one of four Storm starters to finish in double-figures alongside Jewell Loyd (18), Crystal Langhorne (16), and Sue Bird (14). Though the team came up empty on multiple fourth quarter possessions with a chance to cut the deficit to one or tie the game, Storm head coach Jenny Boucek said it was Seattle’s first half performance defensively that cost them in the end. “The first half, give up 50 points, let a good team and good players get into a rhythm, and now you’re digging out of a hole and everything has to go right,” she said. Phoenix led by as many as seven in the first quarter, and took a seven-point lead into halftime. The Mercury took its largest lead of the game early in the third after a Taurasi three-pointer put Phoenix up 57-46, before Seattle countered with a 10-2 run over the next two minutes to pull within three. 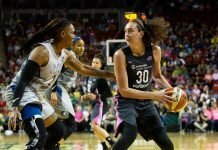 The Mercury held a six-point edge heading into the fourth, and were unable to put Seattle away for good, never extending their lead beyond eight. After a Langhorne layup pulled Seattle back within three with six-plus minutes to play, the Storm defense forced a stop, but a Bird three-pointer was off the mark on the following possession. Just over a minute later, a pair of Loyd free-throws again made it a one possession game, and again, Seattle forced a stop, only for a Langhorne lay-in to fall short. The Storm wouldn’t again have the ball with a chance to tie until there were just 12 seconds left in regulation, after Taurasi was called for an offensive foul with Phoenix up three. But on the ensuing possession, Loyd would lose the handle, with forward Carolyn Swords fighting for a jump ball. Alysha Clark corralled the tip and called time, giving Seattle 3.6 seconds to draw up one final play. The last shot would go to Whitcomb. With the loss, Seattle has now lost four of its last five games, with all four losses coming by eight points or less. For Phoenix head coach Sandy Brondello, the win served as a great response to her team’s 31-point blowout loss in Los Angeles on Sunday. Seattle now embarks on a three-game road swing, beginning in D.C. against the Mystics on Tuesday night. Phoenix returns home to face the Lynx next Friday. Friday’s match up was the first of three games between the Storm and Mercury in 2017. The two teams will face-off again on Aug. 12 in Phoenix, and Aug. 27 at the Key. Danielle Robinson made her return to the Phoenix lineup after missing the last two games with a sprained ankle. She finished with 10 points on 5-of-9 shooting in 30 minutes of work. One Phoenix player received a much louder introduction pre-game than her teammates: Ex-Storm forward Camille Little. Little, who played in Seattle from 2008-2014, finished with eight points in 26 minutes before fouling out. Faces in the crowd — Cleveland Cavaliers star Kyrie Irving sat courtside. Seattle Mayor Ed Murray was in attendance, and received a warm reception when introduced on the jumbotron. Seattle singer-songwriter Sassy Black performed at halftime, while the U.S. Deaf Women’s National Soccer Team was recognized during the game.